Taurus® Judge Public Defender .45 Colt/.410 Bore Revolver. Capable of chambering .410 Bore shotshells and .45 Colt ammo, The Taurus Public Defender is ideal for defensive scenarios at short and medium distances. Taurus has finely tuned the rifling to spread the shot pattern at close quarters or to guide the .45 Long Colt bullet to the target. Fully customized with fixed rear sights and rubber grips, the Taurus Public Defender is one decision-maker that lays down the law. 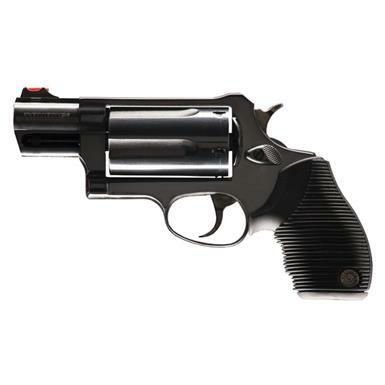 Taurus Judge Public Defender, Revolver, .45 Colt/.410 Bore, 2 Barrel, Blued, 5 Rounds is rated 5.0 out of 5 by 2. Rated 5 out of 5 by AMoo from Home defense Like it for home defense and dual ammo.Can use it on snakes Aand predictors here on the farm.Has a fair amount of kick for my smaller hands,but know it would be a stopper if needed. Rated 5 out of 5 by gdgraham99 from LOVE IT!!! I'm the envy of all of my friends, family, co-workers and I absolutely LOVE it!! Concealed carry protection doesn't have to weigh you down.